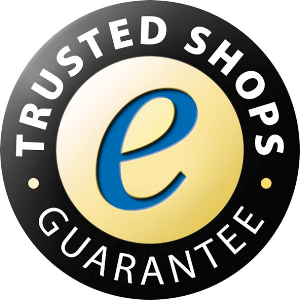 We have been awarded the famous Trusted Shops label, which, regardless of the payment method used, has guaranteed secure online shopping since 1999! During certification, all retailers are subjected to comprehensive security checks in more than 100 different categories in the areas of credit rating, security practices, price transparency, reporting requirements, customer service and data protection. These criteria are constantly adjusted to the most recent developments in jurisprudence and consumer protection. And if there should still be any problems, the money-back-guarantee for consumers (details about this guarantee are available here) applies for all certified online shops. It concerns non-delivery or non-reimbursement after a return of goods or credit card misuse. You can contact the multilingual Trusted Shops service center via the online system, via email or by phone. More information is available via the direct Trusted Shops link.